We have another week of fun, almost exclusively vegetarian recipes planned for the next seven days. On Sunday night, we’ll make the The Newlywed Kitchen’s Red Wine and Mushroom Risotto. You might remember we planned to make this dish on Friday of last week, but we were pretty wiped out when we got home and decided to order in sushi instead. We like to pair sushi with India Pale Ales, so we had a chance to try a new one: Ommegang Brewery’s Nirvana IPA. Tony will be out to dinner with friends Monday night, so Kim will be on her own. 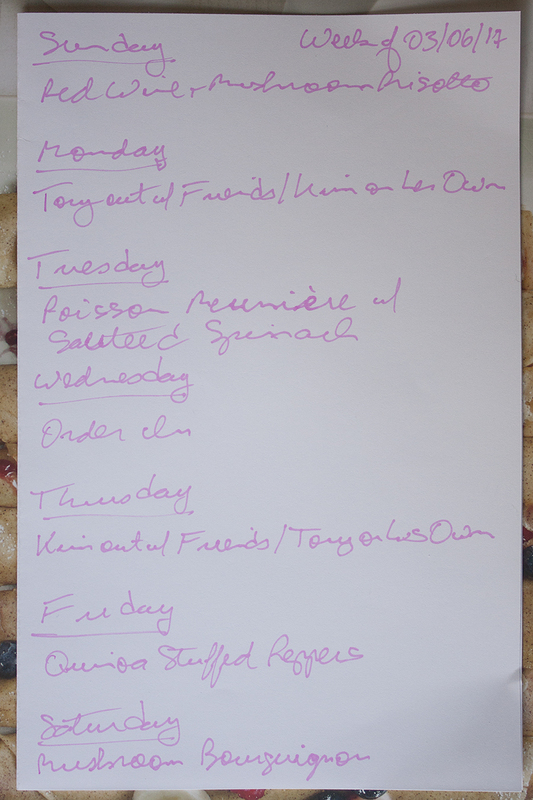 On Tuesday, we’ll make Rachel Khoo’s Poisson Meuniere, which we’ll have with a side of sautéed spinach. We’ll dress the spinach with a rice wine vinaigrette and sprinkle it with garlicky panko, both of which we have left over from last week, when Tony made Food & Wine’s Kale Salad with Garlicky Panko. We’ll pair the fish with a rose from the North Fork of Long Island, namely, a 2015 from Wolffer Estate. We’ve had mixed success with local wines, but Michael at Columbus Wine and Spirits had us try the 2014 last year and we loved it, so we have high hopes for the 2015 vintage. We’ll order in on Wednesday, but on Thursday, we’ll make the New York Times’ Shakshuka with Feta. This is a super-flavorful egg dish that we’ve made a few times and are looking forward to having again. Michael suggested a red wine for this dish: a 2014 Paranag Kir-Yanni from Macedonia, Greece. On Friday night, we’ll be making skinny taste’s Quinoa Stuffed Peppers. (Please note that the link will take you to the Recipe Girl blog, not the skinnytaste blog, but you should spend time on both sites!) This is an easy dish, but the peppers do take quite a while to cook, so we decided it was ideal for a Friday, because we’ll have the extra time to make it and a chance to sit and relax while the peppers cook. We’ll have this with a 2014 Altesino Toscano Rosso. We’ll be home on Saturday night and will make something a bit more involved, but only a bit: Smitten Kitchen’s Mushroom Bourguignon. We’re still talking about the Rachel Khoo recipe for Boeuf Bourguignon that we made in January, so we thought the vegetarian version would be perfect for our Lent menu. We’ll have this with a bottle of French wine, a 2012 Chateauneuf-Du-Pape, that Tony received as a gift from a dear friend and that we have been saving for a special dinner.